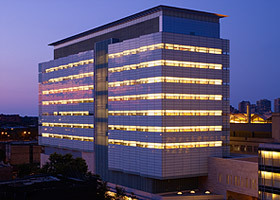 Opened in 2009, the Gwen and Jules Knapp Center for Biomedical Discovery provides 330,760 square feet of new research space for groundbreaking initiatives in the University of Chicago Division of Biological Sciences. This facility houses laboratories and office space for principal investigators, postdoctoral students, and graduate students in the departments of medicine and pediatrics, as well as the Comprehensive Cancer Center. Designed by the award-winning Zimmer Gunsul Frasca Architects, this world-class facility provides open, efficient, and flexible laboratory and office space designed to encourage cross-fertilization between labs. It features few walls, most of which can be changed easily, depending on research needs. The building also includes conference and lecture halls and several multi-story public and common spaces–all designed to enhance the exchange of ideas among the 80 scientific investigators and 800 personnel who work there. Facility systems include a central chilled water cooling plant, campus steam with heat exchangers for hot water heating distribution, heat recovery air-handling units, specialty vivarium air-handling units, advanced laboratory controls, daylight harvesting and more.